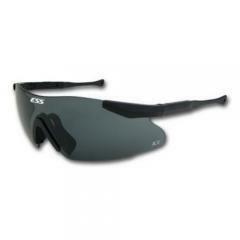 The ESS ICE 2.4 Eyeshield is the most complete eyeshield system on the planet. It includes three optically correct 2.4mm thick polycarbonate lenses for use in any light conditions. The field of view is virtually unlimited with the 'frameless' design of the ESS ICE 2.4, and it will fit anybody, thanks to telescoping temples with bendable inner wire ear tabs. This ESS ICE eyeshield also includes a rugged pouch with lens pockets, a neck leash, and an anti-fog cloth.